Successful treatment makes all the difference to long-term health, and achieving balanced diabetes treatment can be the key to living with both type 1 and type 2 diabetes. Treatment varies for each individual, not simply on the type of diabetes that they have, but also more individual-specific diabetic treatment differences. Your diabetes treatment and management strategy should be agreed between you and your health care team. The aim of diabetes treatment is to keep, within reason, blood glucose levels as near to normal as possible. Training in self management of diabetes forms an essential part of diabetes management. Treatment should be agreed on an individual basis and address medical, psychosocial and lifestyle issues. Read guides on every diabetes medication. Artificial pancreas and islet cell transplants are available. Some foods have blood glucose stabilising properties. A variety of different factors have a role to play in treating diabetes, but the importance of balanced, co-ordinated diabetes treatment for all diabetics cannot be underestimated. Regular and successful treatment decreases the risk of each patient developing diabetes complications. The basics of diabetes treatment are broken down into each diabetic type below. Type 1 diabetes treatment is a daily task. 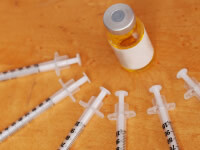 Lack of insulin production by the pancreas makes Type 1 diabetes is particularly difficult to control. Treatment requires a strict regimen that typically includes a carefully calculated diet, planned physical activity, multiple daily insulin injections and home blood glucose testing a number of times per day.